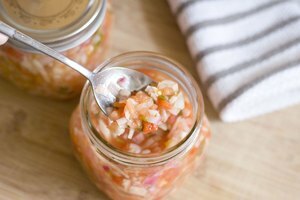 When making and preserving salsa, a pressure cooker pressurizes and seals the jars to prevent the infiltration of microorganisms. For added food safety, properly sterilize your jars and lids before using them and use sterilized jar and lid lifters instead of your hands to move them around. Adding lemon juice to the salsa recipe creates extra acidity, which helps low-acid foods, such as tomatoes, remain fresh after pressure cooking. Immerse the Mason jars, lids and rings in dish soap and hot water to sterilize them. Scrub and rinse them with hot water to remove all soap residue, or wash them in the dishwasher, using the sanitize cycle, if available. Allow the metal rings to air-dry at room temperature. Fill a pot large enough to fit your mason jars with hot water. Position the glass jars in the hot water. This increases the temperature of the mason jars, preparing them for pressurization. Bring a small sauce pan of water to a simmer. Arrange the flat lids in the water to simmer until ready to pressurize. Prepare your salsa while sanitizing your jars and lids. 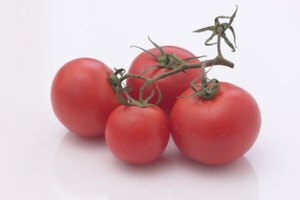 Remove the skin from the tomatoes. Cut the tomatoes in half and remove the water and seeds. Strain excess water from your tomatoes, using a colander. Dice the tomatoes and put them in a sauce pot. Simmer the tomatoes on medium heat. Wash, chop and add onions, jalapenos, garlic cloves, tomato paste and lemon juice. Add the contents of a salsa spice packet, or your own blend spices such as cilantro, cumin, salt and pepper. Reduce the heat to low. 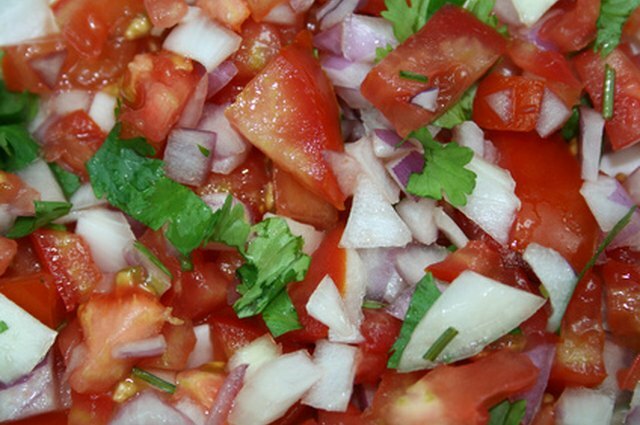 Mix the salsa ingredients over low heat with a spoon. Simmer the salsa on low for 30 minutes, stirring frequently. Take the Mason jars out of the hot water. Ladle or funnel your salsa into the mason jars, leaving ½-inch of head space at the top of each jar to prevent the salsa from overflowing once pressurized. Wipe the top of the jars where the lids seal onto and the exterior of the jars with warm water and a clean cloth to remove any spillage. This helps the lids adhere and seal. Take the flat lids out of the hot water, using a sterilized lid remover or tongs. Place the flat metal lids on top of the jars. Tighten the metal rings clockwise around the flat lids. Fill your pressure cooker with hot water so that the bottom half of the jars or the entirety of the jars will be immersed in water. The water level depends on what the recipe and pressure cooker manual calls for. Place the filled mason jars into the pressure cooker. Open the steam vent on the pressure cooker's lid. Cover the pressure cooker with the lid. Place the pressure regulator on the vent pipe. Set the stove-top temperature to high heat and bring the water in the pressure cooker to a boil so that the pressure regulator on the vent moves in a back and forth motion. The regulator should move in a slow and steady rhythm, adjust the heat if you do not have this rhythm. The processing time for the salsa recipe begins when the pressure regulator is slow and steady. Process the jars for the amount of time required according to the pressure cooker's manual and the salsa recipe. Eight-ounce jars of salsa typically require boiling for 15 minutes at altitudes below 1,000-ft., 20 minutes at altitudes between 1,001 and 6,000-ft. and 25 minutes at altitudes above 6,000-ft. Turn off the heat and set your pressure cooker onto an unused burner to cool for 10 to 15 minutes or in accordance to the pressure cooker's manual guidelines. This allows the pressure in the cooker to drop. Once the vent lock drops, the cooker is depressurized. Take off the pressure regulator and the pressure cooker lid. Spread a dish towel out on the counter-top. Lift the jars of salsa out of the pressure cooker with the jar lifter. Place each jar on the towel so that they are not touching each other. Allow the jars to sit for up to 24 hours before moving them. Test the seal of each jar by pressing your finger into the middle of the flat lid. Try to lift the flat lid off with your finger. The lid is safely sealed if it does not dent or pop when you apply pressure and if you can’t open it with your fingers.